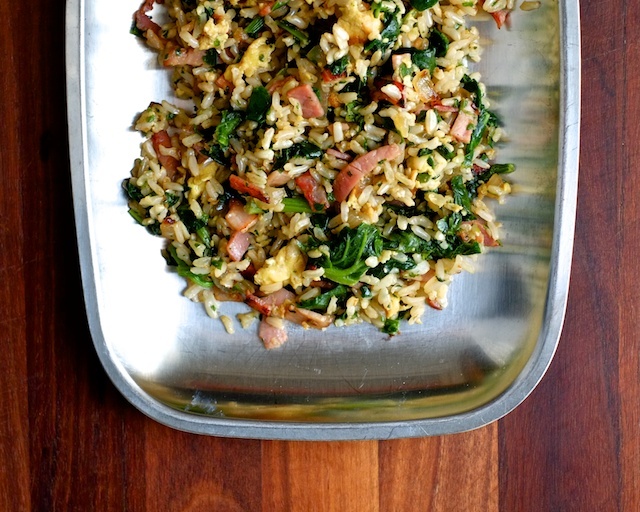 Fried rice is normally a side dish, but this one is hearty enough to stand alone, which makes it really good for first time cooks – one pan, a few minutes, and you’re done. It’s also a great introduction to the fact that what you can whip up at home is often much tastier (and also cheaper) than what you can have delivered to your door in a white paper box. Admittedly, there are nights when letting someone else make your dinner sounds really nice, but it’s best if those nights are the exception rather than the rule. 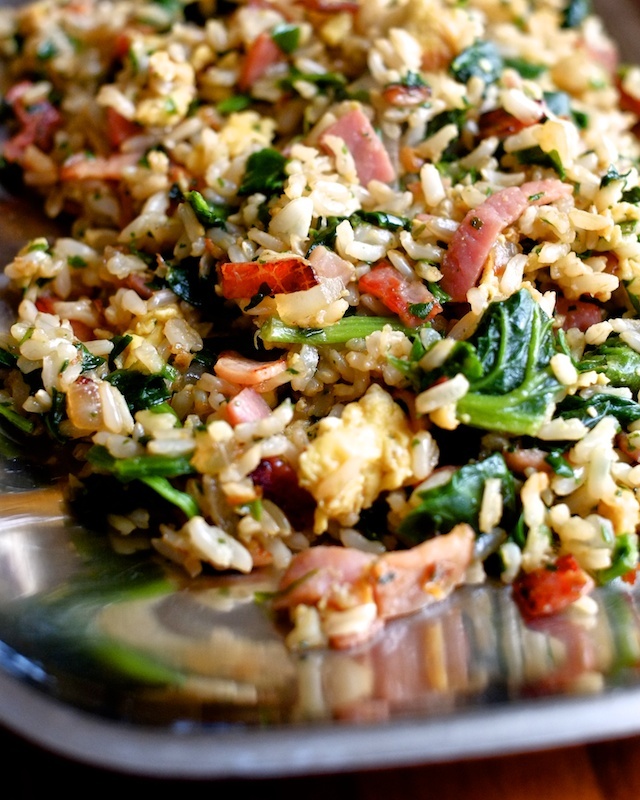 Fried rice works best with leftover, chilled rice because it will hold it’s shape and texture better than fresh, hot rice. Maybe you have some leftover brown rice from making burrito bowls? Or maybe in a moment of weakness you ordered some takeout and have a leftover carton of brick-ified white rice in your fridge, inching its way toward nastiness? This is the perfect way to use it up. 1. In your biggest nonstick pan, heat neutral oil over medium heat and cooked diced onion until translucent. 2. Add ham to the pan and cook until the ham is lightly browned on the edges. Move the onions and ham to the sides of the pan and add another tiny bit of oil to the now-cleared center of the pan. 3. Scramble your eggs in the middle of the pan. The eggs will cook quickly, so stir them constantly until they are thoroughly cooked. 4. As soon as the eggs are cooked, add your garlic and rice. Stir everything together and let it heat through. 5. Add spinach straight from the freezer and cook until the spinach is thawed and heated. 6. Add soy sauce and sesame oil and stir to make sure everything is incorporated. Taste and add more soy sauce in place of salt if you like. 7. You should probably top it with sriracha.